In 2017 our family decided to spend the year not buying any non-consumable goods. 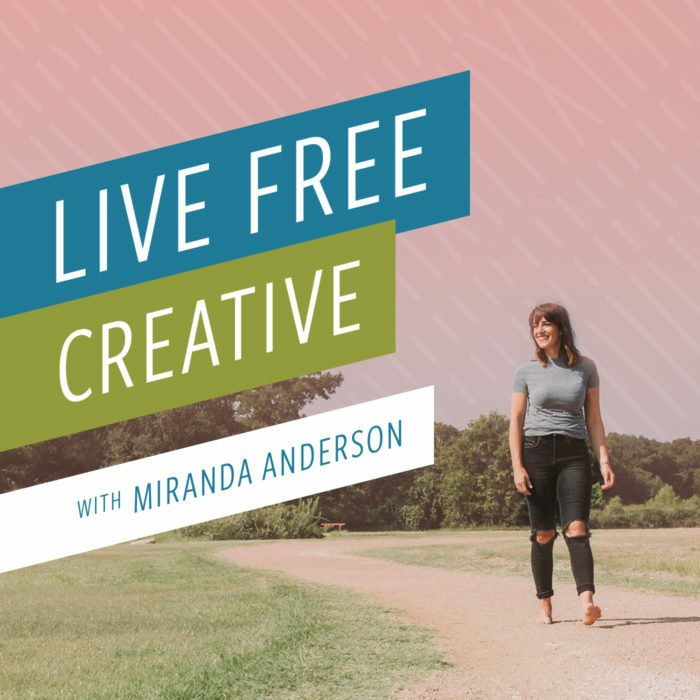 I am really excited to share about this challenge on the podcast, to introduce a lot of the ideas I share on the blog often about minimalism, intentional living, and creating a family culture where you love what you do. I get questions all the time about our year without shopping, and hope you get a good feel for the experience in this week’s show! I went to Aldi for groceries the first time this week and had a great experience. You need to know a couple things before you go. First, take a quarter to get a shopping cart. Second, enjoy all of the inexpensive European imports of cheeses, charcuterie, and chocolate. In fact, the dark chocolate sea salt caramels were my favorite. Third, you have to bring your own bags, or buy some there. Then, when you get through the line, take your cart of groceries (that the checker has loaded back into your cart without bags) over to the counter and bag them yourself. I didn’t realize the bagging situation and ended up loading my groceries into my car loose. It was hilarious and I am excited to go back now that I understand the system! I recently joined a local rock climbing gym that also has fitness and yoga classes. It was just the push I needed to get back to a regular schedule. I have been so sore and enjoying this new routine so much. If you are having a hard time working out, maybe try something totally new! I love the Indigo Girls! I have been listening to their music a lot lately, and really enjoy the harmonies and the poetry. I can sing along because I know almost every track. I think their lyrics are so impactful and applies to everyday life. There is also a hilarious comedy special on Netflix with Tig Notaro, where she does a great closing bit on the Indigo Girls, and it totally sucked me in. Seriously so funny. I have been invited to share about our year of not shopping on a few other podcasts, and each one took a slightly different angle in exploring our experience. Check them out here! All during our year of not shopping, I shared about the experience on my blog. These posts chronically some of the challenges we faced, and the solutions we found. This experience was really formative for our family, and I hope it will inspire some positive change in your live, too! When I decided to spend a year not shopping, it was not my first foray into minimalism. A couple years before, I had been overwhelmed by my schedule, to-do list, and STUFF in my life. I had already been eliminating unnecessary belongings from my life. I had also been using a capsule wardrobe for a few years, and recognizing the value of less stuff and fewer decisions feeling like more freedom. In the months leading up to this challenge, I had been feeling systematically overwhelmed by stuff. We had designed and decorated our house over the years leading up to 2017 for a big feature in The Glitter Guide, and everything was basically done. One night I was cleaning our the cabinets in our kitchen and was absolutely blown away by how much stuff we had. I got rid of five garbage bags of stuff, and was so confused how I even had that much stuff in my cabinets that I didn’t need! I watched The Minimalist Documentary and although I liked it a lot, I felt like a lot of the examples of lifestyles portrayed were really unreliable for a family. 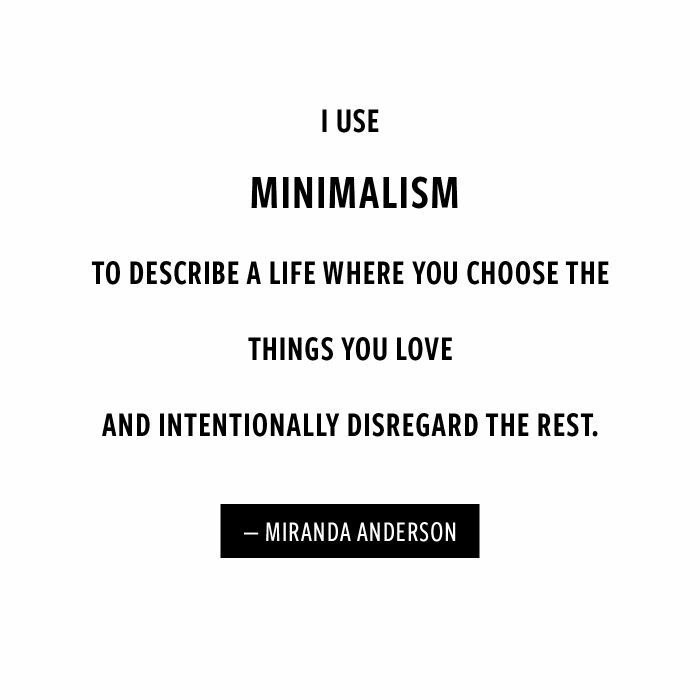 I thought there had to be some connection to the principles I had been feeling of minimalism and choosing things that matter most, and our real, crazy, family life. One of the lines that really hit me from the movie was the idea of using the things you have, rather than buying more. I realized that we absolutely had enough stuff and we weren’t using all of it! We had more than enough stuff. So I turned to Dave and proposed the idea of not buying anything for a year, so we could focus on the using things that we already had. There were so many reasons it felt like a great idea, Dave was on board, and it was as simple a decision as that! We decided to undertake the challenge for a whole year because it was the very begging of the year and we were in resolution mode! This was January 6th of 2017, and so we thought this could be our challenge for the year! In the morning, we explained to our kids that we weren’t going to buy any new stuff this year. Our kids were excited and also little concerned. One of our sons asked what he would do if he wanted a new toy. We turned that question back on him, and he came up with the idea of making a new toy using craft supplies. He already got it! We had more than enough stuff and could be creative to fill our needs and wants. We wanted to look around us in our lives and feel like we had so much. “Everything we need is readily available to us” is the idea we wanted to feel on a regular basis. We wanted to practice gratitude by being aware of, using, and loving the things we owned. This feels similar to abundance, but it is different because abundance is a mentality, and gratitude is a practice. It is words spoken, ideas written, and things used. Giving ourselves and opportunity to recognize the things that we had, being aware of them and using them felty like a great way to practice gratitude. For our challenge of not buying things for a year, we meant we wouldn’t buy non-consumable goods. Consumable goods are things that you can use up to completion. Things like food, printer ink, lightbulbs, and lotion. The consumable goods were things we would continue to buy and replenish as needed in our life. Non-consumable goods are the things that you don’t use up all the way. We decided we wouldn’t be buying clothes, shoes, home decor, kitchen gadgets, toys, books, gear, electronics and everything else. We had enough sheets and towels and tents. We had everything we needed, that was the whole idea! And so we didn’t;t need to buy any more! What About Clothes For The Kids? People wonder how we handled not buying clothes with little kids. Well, it was pretty easy in Austin, Texas where we lived when our challenge began. We mostly wore the same clothes year round anyway because the seasons are so mild. We also had a caveat that if someone grew all the way out of something, we could replace it with a similar item in a bigger size. For example, my middle son walked holes in his cowboy boots by the second or third month of the challenge. We didn’t go out and buy a bunch o things to prepare for the year of not shopping. We literally decided to begin, and began with what we already owned. So, he had been wearing his boots already for a year or so, and when he was getting wet feet from walking through the grass, I decided to replace them with a pair in a bigger size. We weren’t trying to look for loopholes in the challenge or find ways to cheat. This was our challenge! No one was forcing us to do anything, these were decisions we were making on our own. We felt like the benefits outweighed the challenges. Our kids make their own money doing chores, and we allowed them to use their money on whatever they wanted. They always wanted legos. We didn’t buy the kids any toys at all during our challenge. They bought themselves some legos. What Did You Give For Gifts? For birthdays and holidays we gave gifts of experience! (Here is a list of 50 I shared last year.) Our son wanted a membership to an online computer game, so that is what he got! They did have birthday parties, and were excited to get some new toys from their friends. We also gave gifts of experience to friends with movie passes, gift cards, and other consumable items. I was blown away by how much stuff we got, even without buying things. People gave us gifts for holidays, we got stuff from events and festivals. As a blogger, I am given free things all the time, and bags full of swag at conferences. I chose to give most of the things away rather than keep them, so that I was staying true to the idea of not adding things to our life that we didn’t need. Read more about gifts here. Find lots of answers to frequently asked questions about our year of not shopping in this recap post. People ask me all the time how I didn’t shop for a year. And you know how I did it? By not going into stores unless I needed something! I stopped using shopping a pastime or as a crutch. There are all sorts of research about other ways to get that shoppers high than shopping. You can feel that same adrenaline rush without even buying things, just from putting it in the cart! There are a bunch of other, more useful ways to feel those same feelings. 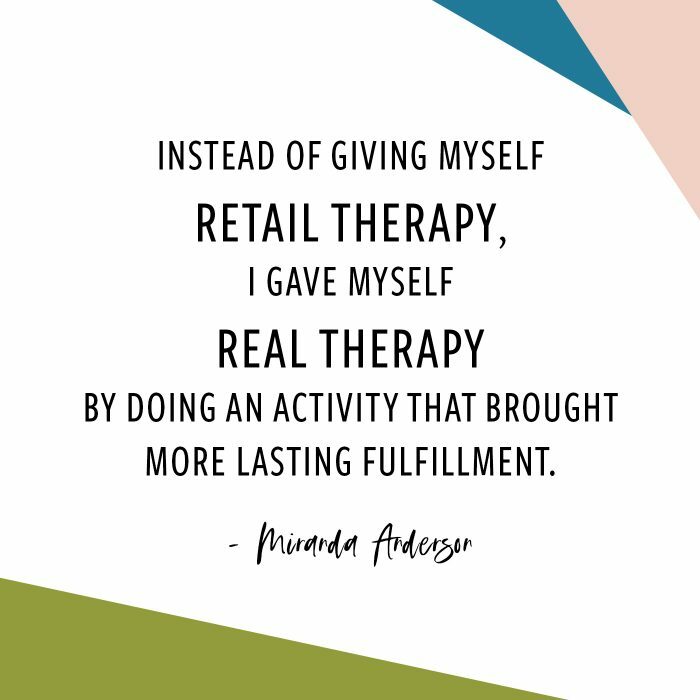 When I talked about “retail therapy” in my life before the challenge, what I really meant was that I need some time to be inspired or to have a break. I need to reduce my stress. It usually meant that I needed some time without my kids around. And I can fulfill all of those things without buying things and adding unnecessary stuff to my life. Go to a museum and be inspired by actual works of art. Can you borrow something instead of buying it? Like I mentioned in Episode 2, when you ask people to help you, you can even build a relationship. An example is that for our family pictures last year, I didn’t buy any new clothes. We borrowed outfits from my sisters and their kids, and it not only gave us an opportunity to hang out with family, I also didn’t spend and money, stress about their clothes, or add unnecessary outfits to our life. Our rally cry as a family is “Less Stuff, More Adventure!” During our year of not shopping, we learned to use experiences as motivation for our kids, we used experiences as gifts and as rewards. I like some stuff. I don’t thing stuff is bad. You see me on Instagram, opening packages and decorating our new home. I have really learned to hone in on what I do love and want and filter though the constant bombardment of consumer driven marketing. I am able to so simply avoid things that don’t add value to my life. Our perspective and family culture shifted a lot during this challenge, and the impact has been universal. I now think through the lens of less stuff, more adventure, building an intentional lifestyle with lots of fun and minimal stuff. I can more easily see what matters to us, and what is a distraction. Here are some specific ways this challenge has been impactful. I have developed a personal style and can make quick and easy decisions. Being decisive and not like in confusion and chaos helps eliminate distractions and the energy waste that I talked about in episode 2. When you are not spending all of your time considering whether or not you want that thing, you are able to be decisive about the things you do want. We say yes to adventure. We were able to filter out all the decisions, so we had so much more energy to make decisions about how to spend our time. We downsized to a smaller home. Half-way through our year of not shopping, Dave accepted a new job in Richmond, VA. Because we had an opportunity to make a change with out house, we decided to downsize into a smaller home. You can read all about this decision here. When we moved in, nothing fit and you can see how hilarious that was in this youtube video. Instead of deciding that meant we need more space, we decided that meant we needed less stuff, so we got rid of even more. Choosing to rent a tiny home for the year meant we had the freedom to look for a house that we wanted to buy, find one, and renovate all before we moved in. We had the financial freedom to pay both a rent and a mortgage while we renovated. We live in this society that is constantly selling us things and telling us that our life will be better, happier, and more successful if we just buy or have this or that thing. I realized so fully, that that isn’t true. Cutting myself off from all of those things that supposedly sold happiness, I was able to live the reality that none or that stuff is what makes us happy. None of that stuff is what makes us successful. The only things that matter are the way that we live and the way that we choose to think. My life has only gotten better as I have become more intentional about the things that I add to it. What life looks like now is so different than what life would have looked like had we not undertaken this challenge. We have downsized, we now live in Richmond instead of Austin, we definitely need all of the seasonal clothing here. I continue to eliminate things! I think is crazy that I still have stuff to get rid of. I am going room by room, and being really intentional about what I choose to keep in there. I am decorating our home in a thoughtful way and uses the space in a way that makes the most sense for our family and the values we have. I still shop in capsule wardrobes. I only buy things that I love and that will last. I don’t shop according to the commercial seasons, and choose new things when it makes sense for our family. I remember seeing a quote in a store one time that said “We have new things coming in every day, so should you!” I remember being blown away by this idea that people were supposed to go shopping more often just to see all the new things. I don’t think that we need new things just because they exist. The world is not going to tell us to stop buying things or to stop filling up our closets or our cabinets or stop draining our wallets. The world is going to continue to tell us that there is more that we need. And it will also tell us that our success and our happiness depend on these things. And I refuse to believe that. I refuse to believe that you need more of anything, except maybe compassion and love and gratitude, to live a more fulfilled life. I also think of a lot more things as disposable. I don’t hold as tightly onto things. I freely let things flow in and out of my life. My son recently had a birthday party, and I could tell right away that some of the toys he was given as gifts would be things he would use all the time, and there were also a few things I could see wouldn’t become favorites. So, we spent a day playing with one of these cool sets, had a great time, and then donated it to goodwill so another kid will get to have a great time with it. I don’t feel like I have to keep everything that comes into my life. I am able to evaluate: What is going to add real value? What are we really going to use? What do we really love? then freely let go go the rest. Regular adventures and travel have become part of our family lifestyle. I was always a goer and doer and an adventurer. And those experiences have become our default. We say yes to travel, yes to adventure. Going to the museum, on a hike or a bike ride. We are constantly seeking our ways we can spend more time together. Even when we are home, baking something in the kitchen, or snuggled up reading books on the couch. I approach my life from a perspective of adventure and quality time. We choose things that add value to our everyday life and disregard the rest. After a whole year of what we have that we end up using, we were able to see what we really loved. When faced with the option of no other options, we would generally turn to the favorites. It was easy to see what we really loved and used, and recognize things we didn’t need. Think in your own life how you could apply some of these same principals! This challenge was a way to take some of the ideals and principals that we had been thinking and feeling, and put them into practice in our everyday life. We continue to practice them in our life now without the challenge guidelines. We have never been happier. Our lives have changed for the better. I have learned how free I am to fill my life with the things I love and absolutely disregard the things I don’t. This mindset of abundance, patience, and gratitude has shifted our perspective, priorities, and the belief we have that we can create the life we love for our family, that will be different from everyone else. I am excited to use this episode as a jumping off point for you to understand where I am coming from as I dive into more detail bout some of the topics of minimalism, capsule wardrobes, intentional living, small spaces, and choosing experiences.